ZHANG, Y. , WANG, P. , CHENG, P. , LEI, S.
Due to the sustainable and pollution-free characteristics, wind energy has been one of the fastest growing renewable energy sources. However, the intermittent and random fluctuation of wind speed presents many challenges for reliable wind power integration and normal operation of wind farm. Accurate wind speed prediction is the key to ensure the safe operation of power system and to develop wind energy resources. Therefore, this paper has presented a wavelet time series wind speed prediction model based on Lorenz disturbance. Therefore, in this paper, combined with the atmospheric dynamical system, a wavelet-time series improved wind speed prediction model based on Lorenz disturbance is proposed and the wind turbines of different climate types in Spain and China are used to simulate the disturbances of Lorenz equations with different initial values. The prediction results show that the improved model can effectively correct the preliminary prediction of wind speed, improving the prediction. In a word, the research work in this paper will be helpful to arrange the electric power dispatching plan and ensure the normal operation of the wind farm. J. Z. Wang, Y. L. Song, F. Liu, R. Hou, "Analysis and application of forecasting models in wind power integration: A review of multi-step-ahead wind speed forecasting models," Renewable and Sustainable Energy Reviews, vol. 60, pp. 960981, Feb. 2016. C. D. Zuluaga, M. A. Álvarez, E. Giraldo, "Short-term wind speed prediction based on robust Kalman filtering: An experimental comparison," Applied Energy, vol. 156, pp. 321330, Jul. 2015. J. Koo, G. D. Han, H. J. Choi, J. H. Shim, "Wind-speed prediction and analysis based on geological and distance variables using an artificial neural network: A case study in South Korea," Energy, vol. 93, pp. 1296-1302, Nov. 2015. Ü. B. Filik, T. Filik, "Wind Speed Prediction Using Artificial Neural Networks Based on Multiple Local Measurements in Eskisehir," Energy Procedia, vol. 107, pp. 264  269, Sep. 2017. Y. Noorollahi, M. A. Jokar, A. Kalhor, "Using artificial neural networks for temporal and spatial wind speed forecasting in Iran," Energy Conversion and Management, vol. 115, pp. 1725, May. 2016. H. R. Zhao, S. Guo, "An optimized grey model for annual power load forecasting," Energy, vol. 107, pp. 272-286, Jul. 2016. 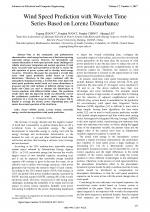 H. P. Liu, J. Shi, E. Erdem, "Prediction of wind speed time series using modified Taylor Kriging method," Energy, vol. pp. 35, 4870-4879, Dec. 2010. E. Erdem, J. Shi, "ARMA based approaches for forecasting the tuple of wind speed and direction," Applied Energy, vol. 88, pp. 14051414, Oct. 2011. Y. G. Zhang, P. H. Wang, T. Ni, P. L. Cheng, S. Lei. "Wind Power Prediction Based on LS-SVM Model with Error Correction," Advances in Electrical and Computer Engineering, vol. 17, pp. 3-8, Feb. 2017. J. Heinermann, O. Kramer, "Machine learning ensembles for wind power prediction," Renewable Energy, vol. 89, pp. 671-679, Dec. 2016. A. Glowacz. "Recognition of Acoustic Signals of Loaded Synchronous Motor Using FFT, MSAF-5 and LSVM," Archives of Acoustics, vol. 40, pp. 197-203, Feb. 2015. L. Karthikeyan, D. N. Kumar, "Predictability of nonstationary time series using wavelet and EMD based ARMA models," Journal of Hydrology, vol. 502, pp. 103119, Aug. 2013. H. K. Lam, F. H. F. Leung, and P. K. S. Tam. "Stable and Robust Fuzzy Control for Uncertain Nonlinear Systems," IEEE Transactions on Systems, Man, and Cybernetics-part A: Systems and Humans, vol. 30, pp. 825-839, Nov. 2000. R. E. Precup, S. Preitl. "PI-Fuzzy controllers for integral plants to ensure robust stability," Information Sciences, vol. 177, pp. 44104429, May, 2007. A. El-Gohary, F. Bukhari, "Optimal control of Lorenz system during different time intervals," Applied Mathematics and Computation, vol. 144, pp. 337351, Dec. 2003. J. Lu, J.H. Lv, J. Xie, G. R. Chen, "Reconstruction of the Lorenz and Chen Systems with Noisy Observations," Computers and Mathematics with Applications, vol. 46, pp. 1427-1434, Oct. 2003. D. C. Kiplangat, K. Asokan, K. S. Kumar, "Improved week-ahead predictions of wind speed using simple linear models with wavelet decomposition," Renewable Energy, vol. 93, pp. 38-44, Aug. 2016. X.L. An, D.X. Jiang, C. Liu, M.H. Zhao, "Wind farm power prediction based on wavelet decomposition and chaotic time series," Expert Systems with Applications, vol. 38, pp. 1128011285, Sep. 2011. A. Glowacz. "Recognition of acoustic signals of induction motor using FTF, SMOFS-10 and LSVM," Eksploatacja i Niezawodnosc-Maintenance and Reliability, vol. 17, pp. 569-574, Sep. 2015. Y. G. Zhang, J. Y. Yang, K. C. Wang, Z. P. Wang, "Wind Power Prediction Considering Nonlinear Atmospheric Disturbances," Energies, vol. 8, pp. 475-489, Jan. 2015. W. Tucker, "The Lorenz attractor exists," Comptes Rendus de l'Académie des Sciences - Series I - Mathematics, vol. 328, pp. 1197-1202, Jun. 1999. Y. G. Zhang, J. Y. Yang, K. C. Wang, Y. D. Wang, "Lorenz Wind Disturbance Model Based on Grey Generated Components," Energies, vol. 7, pp. 7178-7193, Nov. 2014. P. M. T. Broersen. "Automatic Time Series Identification Spectral Analysis with MATLAB Toolbox ARMASA," IFAC Proceedings Volumes, vol. 36, pp. 1435-1440, Sep. 2003. 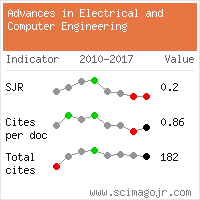 Citations for references updated on 2019-04-21 19:35 in 162 seconds. Website conception, design and maintenance by Eugen COCA. Content updated on 28 Feb 2019. Site engine updated on 28 Feb 2019. This page was generated on the server in 0.113 seconds and loaded in your browser in > seconds.